The West Specialist Inclusive Learning Centre (SILC) is a special school in the west of Leeds. Across the school’s five sites, they cater for children and young people with a wide range of needs, ranging from moderate learning difficulties, severe learning difficulties, complex and multiple learning needs, Asperger syndrome, Autism and social and emotional and mental health needs. Like all primary schools across the country, the partnership’s primary school sites have received the Primary PE and sport premium since 2013. Through the premium, the government currently provides £160m a year of ring-fenced funding to help improve the quality of PE and sport teaching in primary schools. What sets the West SILC Partnership apart, however, are the ways in which they have used the premium to provide children with disabilities and a range of special needs with high quality, meaningful and inclusive participation in sports and physical activity. One of the initial uses of the premium was to buy into the Leeds Active Schools offer. Through the Active Schools offer, Angela Lydon, the SILC’s PE subject lead, was able to access PE Subject Leader’s training, working through the first four modules of the Youth Sport Trust’s (YST) Subject Leader course. Angela was subsequently able to work closely with the Leeds School Games Organiser for Inclusion to build an events and competition calendar for students with Special Educational Needs (SEN), as well as becoming a lead member of a steering group for the SILC’s PE leaders. This has significantly increased the participation of West SILC students in events and competitions and raised the awareness and profile of PE across the SILC. The premium funding has also allowed the SILC to invest in resources and activities across their sites. This includes purchasing polo shirts with the school logo to provide students with a team identity and a real sense of pride as they represent their schools at events and competitions. 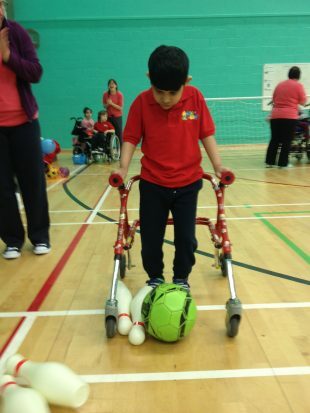 They have also invested in a range of equipment for disability friendly sports such as New Age Kurling and Boccia sets, Table Cricket and Polybat, as well as a range of standard resources such as balls and playing mats. The extra funding has also allowed them to invite a number of guest coaches into the school, including the Leeds Rhinos Foundation running tag rugby sessions and a one off Inclusive Zone Basketball session, run by an experienced coach. At the SILC’s Farnely site, which caters to children with Complex and Multiple Learning Needs (CMLN), the school’s PE provision has been developed through accrediting to Special Olympics and running their Motor Activities Training Programme (MATP) as a timetabled PE session. It enables children with CMLN to take part in meaningful physical activity and competition tailored to their needs. This Special Olympics programme not only gives the children an opportunity to showcase what they can do, instead of what they can’t, but it also helps them to develop their motor skills. The programme runs in blocks of 8 to 12 weeks, and at the end of every term the children participate in a challenge day. This challenge day is a full sporting event in the truest sense. Complete with an opening ceremony and full audience, athletes come out and are able to share their motor achievements with colleagues, family and friends in a real, meaningful way. The success of West SILC’s innovative use of the premium funding has also provided them with the ambition to share their knowledge and best practice further. With plans underway to develop MATPs in other SILCs across Leeds, as well as a SILC football league, they will be able to play a key role in helping to further develop the provision of PE, sport and physical activity for students with SEND across Leeds.